Parks at work at his desk, ca. 1946. 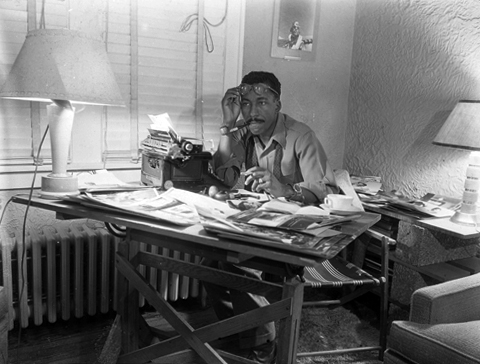 Gordon Parks was an accomplished writer of memoirs, poetry, novels, and plays. In addition, some of Parks’ earliest published works include two books on photography techniques, published on the cusp of Parks’ career at Life magazine. After establishing himself as a photographer of note, Parks wrote his first of several novels, The Learning Tree (1964), a semi-autobiographical account of a black boy growing up in segregated Kansas that would later be adapted for film. Some of the earliest publications that include images Parks made for Life were collections of Parks' poetry with Parks' accompanying images, such as Gordon Parks: A Poet and His Camera (1968). The books Glimpses Towards Infinity and Arias In Silence showcase Parks’ later abstract photographic work, which were a far departure from his photodocumentary style he’s best known for. Parks continued to author works throughout his life, spending several of his last years researching the life of the English Romanticist painter Joseph Mallord William Turner whom his final novel, The Sun Stalker, a work of historical fiction, is based upon.